Update: Fried Chicken is served on Saturday, Sunday, and Monday. Tuesday and Wednesday is now Meatloaf night; Thursday and Friday evenings offer turkey dinners. 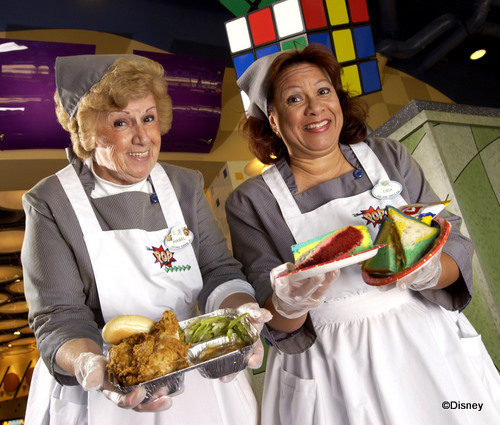 The “Mom’s Night Out” meal fits perfectly into the resort’s theme, which highlights famous and popular toys, inventions, and productions from the 20th century. In this case, “Mom’s Night Out” refers to the nights when Mom went out to the PTA meeting or bowling league, meaning Dad and the kids got to have TV dinners! Except this isn’t just any TV dinner — and it sure doesn’t taste like it came out of the microwave. Head over to Pop Century’s food court from 4-10pm any night of the week to sample the Mom’s Night Out dinner — Saturday, Sunday, and Monday feature fried chicken; Tuesday and Wednesday bring turkey; and Thursday and Friday are pork. The best part (in my opinion) is the fresh cornbread with each meal. Which is your favorite Mom’s Night Out meal? 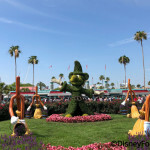 And let us know of the other “resort favorites” you’ve seen and tried! 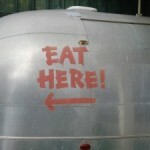 Hmmm…, I’m trying to decide what night I want to stop by for dinner when I’m down for my research trip in April. I loved the turkey dinner…the dressing was especially good. We stayed at Pop back in October, and I have to say I was very impressed with their food court. It was run very efficiently, especially when you compared it to the Contempo Cafe (over at the Contemporary) which was just a hot mess! Didn’t eat dinner, just breakfast and 1 lunch, but if you’re staying at Pop, don’t let the crowded food court deter you, they know how to handle it! Elisabeth — Thanks for the news on the turkey dinner! Kelly — Agreed. We had very good experiences at the Pop food court. I actually tend to get over there even when I’m not staying there; I really like the food. 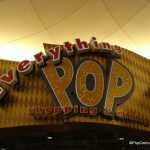 I definitely loved the Pop food court… They make up for not having a table service location by having an amazing selection. I, sadly, was violently ill during my most recent trip so I relied on the food court a couple of times for meals and I was really impressed. 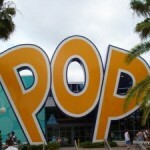 We went to the pop century food court for the turkey dinner last Wednesday for the turkey dinner. 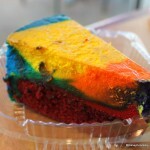 Although the pork is good, I am super happy to hear they brought back the meatloaf…by far my favorite. Also the meatloaf is pretty good at the Prime Time Cafe!